- Material : stainless steel dampers for high temperature applications and are available in a variety of sizes. - Various sealing arrangements can be used to provide the correct efficiency for your application. - Actuation : pneumatically, electrically or manually or reduction gearbox. 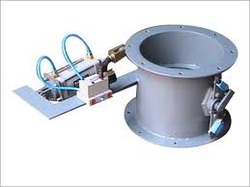 Having rich industrial knowledge, we are into offering Pneumatic Dampers. 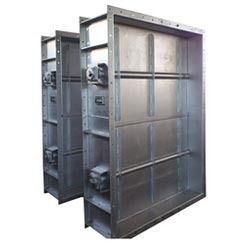 The dampers offered by us are made by the utilization of best raw material. These dampers have been manufactured from latest technology. Our dampers have superior performance level. The offered dampers have simplified operation. Moreover, these Pneumatic Dampers are economical in nature. With the support of our experts, we offer a wide range of Pneumatic Multi Flap Dampers to our clients. These are extensively used in various industries for pre-spinning of duct air, isolation, and modulating service. In order to keep pace with never ending demands of the customers, our company is instrumental in offering Pneumatic Damper. We hold expertise in offering an extensive range of Butterfly Dampers- Motorized & Pneumatic. These heavy-duty dampers are engineered using latest manufacturing facilities so that the end products conforms to set industry standard. Thus, our range is perfect for use in high temperature and pressure applications, where special flanges and other custom features are required. We conceptualize and develop Emergency Stack Damper, in line with the clients' requirements and industry laid parameters. Furthermore, we use high-grade stainless steel and other required basic material for production purposes.